The soil of the industrial revolution stirs. The Brightmoor neighborhood on the west side of Detroit re-imagines itself. It rebuilds relationships with the land and with each other. The Superhero Training Academy unites with the vision of building village, adding our special focus on the education and empowerment of children. We serve the creative genius and power of children, and rally community around their future. We actively break patterns that oppress children. We focus local, and lead global. In three years since the founding of the superhero “HeartQuarters”, we’ve become a community resource for children and families to explore their creativity and shape their life experiences. HeartQuarters is a place of belonging. Inside, we share a library, resource basement, and meditation space, along with a “superhero service hotline” that takes incoming calls for requests for help. Outside, children and families have helped to build an adventure playground and interactive sculpture park across five vacant lots. It is a mythic playscape for the hero, complete with gargoyles and totem poles, zip lines and fort building tools. Two other vacant lots have been transformed into community gardens and a few secret passageways. It serves as a place of education and adventure, building community across ages and races. HeartQuarters is the heartbeat of the Academy. It is a gateway for our global community to visit, the center of our national movement, and the living example of a place based educational model focused on a neighborhood scale. It is open part time as an education center and full time as an adventure playground and sculpture park where all are welcome. We run classes for home school networks, facilitate long lasting youth mentorships, provide community workshops, and are the nexus for various groups to begin adventures into the “Neighborhood Campus” or learn about self-sustaining village. The Neighborhood Campus of education and adventure spans the four square miles of Brightmoor. We share a world class curriculum that is flexible enough to work with educational institutions, neighborhood community projects, faith based organizations, small businesses… We build a culture of connection through celebrating our gifts and supporting each other in developing growth mindsets and active participation. We cross-pollinate these different communities during the fall, winter and spring, and unite them in the Summer Academy that spans the entire Neighborhood Campus. Kids are running around freely, capes flapping in the wind. They know the community places in the neighborhood, and find a sense of belonging and togetherness among their peers and community. They are proud and strong because they know who they are and how to put their gifts to use. They respond positively to negative stimulus, actively shaping their experience and directing their own lives. They have a vision for their lives and a supportive community to help them achieve this vision. Nowhere in the world is the mythology of the hero being expressed like this, shone through the rambunctious imagination and simple, steadfast goodness of children. Students in elementary schools sneak into their lockers and transform into superheroes, embark on a river adventure course and learn the value of teamwork. Home school children are building rocket stoves with super intelligence, visioning out new solutions to global energy challenges. 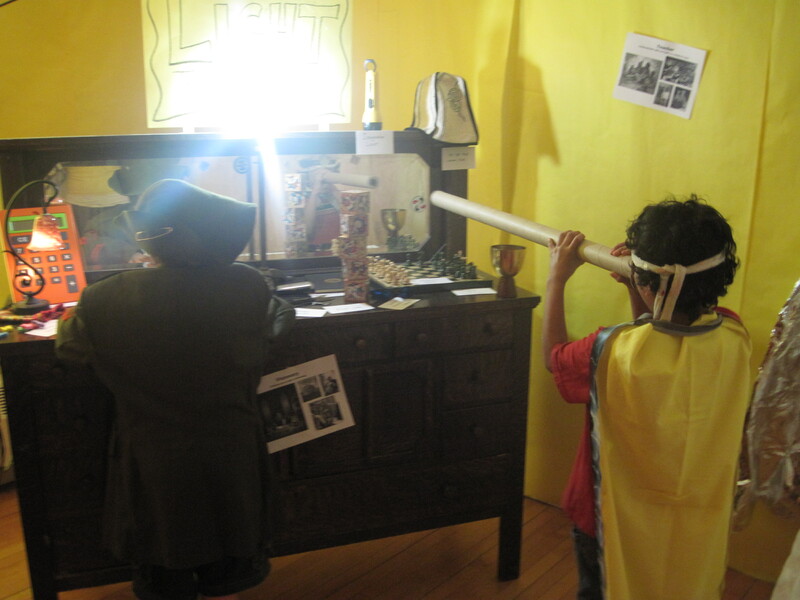 After school, students flip on their cape and blast into the adventure playground, exploring creativity through musical improv and inventing stories to act out. Families and community members invest in our youth, becoming resident educators to teach special skills or mentors for life coaching. We build a heroic culture. 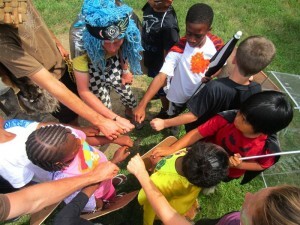 Strengthened by small, intensive systems done with quality and based in relationship, the “superhero spirit” has become a felt presence in the fabric of everyday life in Brightmoor. We are a well-known resource that is trusted and supported. Our impact is evident by the student initiated and community led superhero adventures ~ community bike rides, superhero service hotline line, overnight campouts, secret missions, service projects, sharing abundance with others. The qualities of the hero catch on – joy, wisdom, compassion, and fortitude. It is common knowledge to everyone that the superhero uniform represents someone who is in service to the greater good. This culture is self-sustaining, and spreads throughout our bioregion, across the nation and world. Global educators come to support this vision and share skills and resources. Visitors come to learn, explore, and serve. We are a nexus point for the superhero movement, taking place not amidst our movie screens, but in the wonder right in front of our eyes. We make the mythic accessible. And it catches on fire.